At VroomVroomVroom, we understand that renting a car can be confusing at times. Understanding the process from research to return means that your car rental experience can be a positive one. 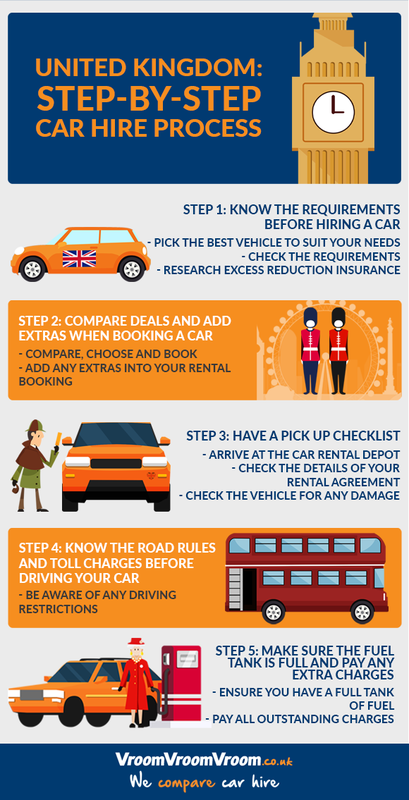 Take a look below at our step-by-step guide next time you rent a car in the UK. Before you book your car hire, make sure you do your research. Think about where you are going, if you are inner-city driving or travelling long distances and what type of vehicle you are comfortable driving. Read more about vehicle types in the United Kingdom. Ensure that you meet the drivers licence requirements. If you are travelling from a different country you may need an International Driving Permit. Read more about licence requirements when hiring a car. More often than not, you need to be 21-years-old to hire a car, where a Young Drivers Surcharge applies to anyone aged 21-24. Read more about car rental age restrictions. If any damaged is caused to your vehicle while it is in your possession, you will be liable to pay an excess amount. The excess amount will be displayed in your car rental agreement. By purchasing excess reduction insurance, you can reduce your excess amount. Read more about excess reduction insurance. For more information on before booking click here. Booking your car hire is a simple and easy process at VroomVroomVroom. It's as efficient as comparing different cars, choosing your perfect rental and booking in under 2 minutes. For our informational video on how to book click here. Will you require a child seat or GPS device? You can either contact our Customer Care Team via email or reply to your confirmation email with the child's age and seat type. The same applies if you would like a GPS. Another option is contacting the supplier directly or messaging us through chat. For more information on extras click here. Take note of the time specified on your booking confirmation. This is when you will need to arrive at the depot to collect your hire car. Ensure that you have your booking confirmation, drivers license and any required documents. For a list of supporting documents that you may be required to show click here. Check the terms and conditions of your rental and ask questions if there is anything you do not understand. Your rental agreement will contain important details about your rental car and show you the excess amount of the vehicle. Before you leave the depot, make sure you check your rental car for any damage not listed in the report. It is a good idea to take some photos if you find any additional damage. You should also report any damage so that it can be added to the report. For more information on picking up your car click here. There are many toll roads in the UK. When you reach a toll road, you will have to pay in order to continue. You can pay in cash, card or with a special pass. For a list of toll roads and more information click here. For more information on driving your car in the UK click here. To avoid any additional charges, make sure you have filled the car with fuel before you return it to the depot. You will not be required to do this if you have pre-purchased fuel. Find a petrol station close to your depot and allow plenty of time to get there. You will be charged for any extra damage caused to the rental car. You may also have to pay extra if you have exceeded the mileage limit, or if you have returned the car without a full tank of fuel. For more information on returning your car click here. From booking your rental to returning it to the depot, you can save the infographic below and refer to it at any point you are unsure of the rental process in the UK.